This is a stunning helmet. 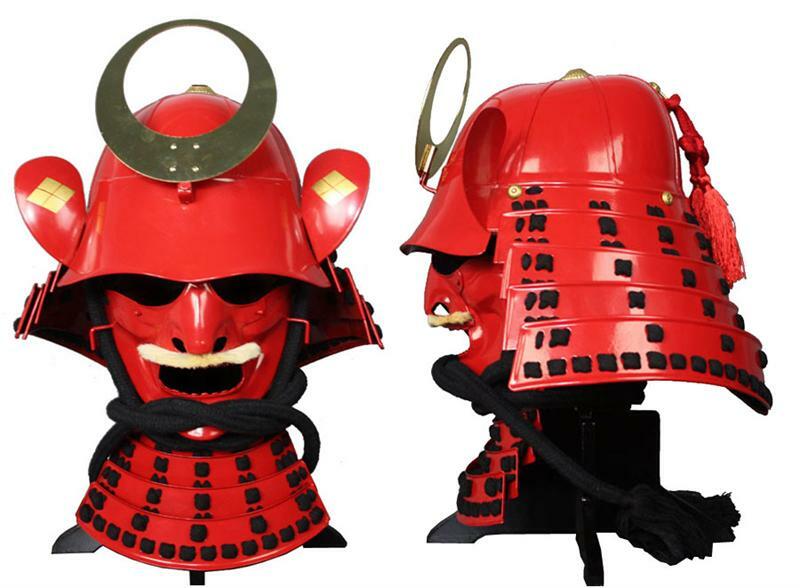 The Takeda clan helmet is highly authentic and will look incredible in your collection, home, office, or dojo. The Takeda clan ruled from the Kai providence for 400 years (12th to 16 century). They quickly rose and became one of the most powerful clans in feudal Japan. Their clan moto was Loyalty and Fraternity. They where known for their calvary charge and for being known as the Red Army. The Takeda banner stated "fu rin ka zan" (wind, forest, fire, mountain) which stands for Swift as the wind, silent as the forest, intrusive as fire, and immovable as a mountain. This hineno-jikoro style kabuto has been painted with the mon (crest) of the Takeda clan in their honor. The solid steel plating and cunstruction is much like the kabuto that samurai often wore in his time. This fine authentic reproduction of traditional Japanese hineno-jikoro style kabuto is hand made by the Fenglinhanjia Armory. Each kabuto is supplied with the matching menpo and a portable kabuto stand, to be proudly displayied. Assembly instructions are also included. The kabuto is wearable and fully functional. Features: Made from 16 gauge steel, battle ready, leather insert with cotton lining and custom wooden stand. Metal construction with colorful cord embellishment on the neck protector and mask. Each piece is hand made and might be different from the picture posted.